Attic24: I'm a BusyBusyBusy Bee! Preparations for Yarndale have been taking up much of my creative time lately, but I've really enjoyed being busy and keeping myself focused. But this past week they've been hanging on the wall in the studio looking very pretty indeed. The yarn in the basket there is the same that I used to make the starflowers, it's the BEST cotton I've ever used, really lovely to work with. Its Stylecraft Classique Cotton DK, which I can highly recommend for decorative crochet work. Blogland is such a wonderful, generous, sharing kind of a place and I was absolutely thrilled when the lovely Hannapat of Cosmos and Cotton blog offered to make me a starflower for Yarndale. She used some very pretty summery shades of Drops Paris cotton, it's always so interesting seeing how others choose their colours! I stretched both these ones tightly across big 70cm hula hoops, they really do look fab. I've got one more beautiful mandala that I'm working on hooping up this week, made by Jacquie (Bunny Mummy blog). So all together I'll have six for my aerial display....can't wait to see how they look. ...and worked for many hours through the morning to complete another woolly sign (my fifth). ....I managed to somehow stitch on letters and eat some delicious soup whilst also carrying out some social media work for Yarndale, it was a full-on working kind of a day! Tomorrow (Wednesday), I'll begin to install all the colourful crochet in the local park ready for Yarndale weekend, I sincerely hope it stops pelting down with rain. Fingers crossed. Alongside all the work I've been doing for Yarndale, I've also been working hard on other projects. I've been finishing up a brand new ripple blanket worked with a beautiful new yarn pack, I am really excited to very soon show you this latest ripple in all it's pretty, colourful glory. It's a real beauty, kind of soft and pretty but bright and cheery all at the same time. That's it up above look - it's called the "Cottage Blanket" as the inspiration behind the colour palette is an English cottage garden. Think of mellow terracotta and old stone, fragrant herbs and pretty summer flowers....sweet peas, lavender, clematis and roses. Delightful! ....we very much hope that you like what we created?! There are some Yarndale woolly images mixed in with a dash of Carole-style (rustic, with vintage inspired colours) and a smattering of Attic24-style (colourful hooky of course!). The calendars will be on sale at Yarndale this weekend, then will go into the Yarndale online shop sometime in October. We will happily ship them worldwide....hoping they get to travel across the globe bringing a little bit of woolly happiness into many homes during 2015. I've recently started thinking about a new blanket design for the Autumn/Winter using a gloriously rich, warm, spicy palette of colours, oh-my-goodness, the thought of it makes me just want to leap up and down with excited anticipation! I'm calling this one the "Cosy Blanket", cos that's what these colours say to me. The colours are inspired by the Autumn Season - leaves and berries, Autumn flowers and harvest time.....yum! In mid October I'll be heading down to London to the Knit and Stitch show at Alexandra Palace, to hang out with Stylecraft Yarns there. If you fancy coming along to say hello and see what I'm up to, I'll be there hooking and chatting during Saturday 11th and Sunday 12th October. SO....I'll be very full on with Yarndale now until next week. I've got a park to yarnbomb. I've got a Knit & Natter Lounge to set up. We've got 6,212 bunting triangles to hang as well as 1, 182 mandala wheels to display. We've got 180 exhibitors to welcome, and then more than 6,000 visitors to entertain.......wish us luck! ps...almost forgot to mention!! !...If you are coming to Skipton for Yarndale, you are welcome to pop in and visit the studio!! Our creative knit n natter session is open to anyone who wishes to join in with some yarn and chat, Friday 9.30-11.30ish at Coopers Cafe Bar (5 mins walk up the road from the train station). I live vicariously through your blog, dear Lucy. It is a courageous thing to have no day job, to be a stay-at-home mom and try to help support the family from a creative activity like crocheting. And what about your pension and health insurance? I have absolutely no problem with you trying to combine the love of the craft with taking care of yourself. In fact, I insist that you take care of yourself :-) I love your attitude, your openness when writing, your generosity with your patterns. Product placement? More power to you. I will dream of quitting my day job, fixing up my studio, working on my creative projects, travelling to Yarndale or making my own yarndale-like festival. Thank you for being my inspiration. I just want to thank you , been trying to learn crochet on and off for years and with you help and easy to follow instructions i can now crochet and on the way making a granny square blanket. So many thanks,keep up with the lovely makes. OMG, where do you get your energy, that's what I would like to know?! How gorgeous these patterns and colors are -- delightful! I'm coming back when I have more time to re-read and digest and visit the blogs that you shared. Many thanks for sharing and warm regards from the USA! Just wanted to say how much my sister and I enjoyed Yarndale. We will definitely return. Also, I am saddened to see such negative comments about your blog. You are an inspiration and your blog brings so much joy to many. Good luck to you in all your pursuits, you deserve to succeed. Ι'm so in love with your garden corner. I wish I had something like that in my (imaginary) house. Good luck with everything you're doing! I so much wish I could pop in at the studio! My first comment after reading your blog for 2 years...once again so inspirational! I don't know how you find the time to do it all! Next year i WILL make Yarndale...sounds fab, hope you get to enjoy it amongst the chaos. Keep inspiring and thank you for getting me into crochet again!! I agree that Mandala photo is begging to be reproduced on a card. I think that mandala photo is going to be on a lot of people's computer desktops. :-) Beautiful! I missed Yarndale last year but I was there this time, it was fab. Looking forward to next year. Hi Lucy, it was lovely to see you looking so relaxed and happy on Sunday. I'm so pleased for you that all this hard work paid off. Enjoy Ally Pally. I bet there will be a whole new bunch of people eager to chat there. I'll be back next year. I wish I could come visit Yarndale too, but NZ is just a little too far. Love your work. Keep it up! Just wondering where the good manners are? When you hold a party, it is customary to say 'thank you for coming' and 'it was lovely to see you'. The party goers say 'thank you for having me' which I have seen in droves all over the internet. Yet it finished yesterday and we are rather short on thank you's from the Yarndale team. Nothing anywhere except after the first day on the Yarndale site. 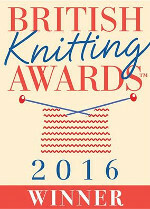 There is a posting on ravelry about next year but that is all. Thank you is just a couple of small words which you hear so often. It might be nice to reflect it back. I bet you're feeling rather exhausted, but I hope that you had a fab time at Yarndale! Your calendar pics would make great notecards too! Hi Lucy, we have just got back in from a lovely time at Yarndale, I've been following your blog for a little while and was so lovely to see your beautiful creations for real, especially your lampshade, I love it. We even spotted my own mandala on display! I brought along my 8 year old daughter who enjoyed learning about spinning and my 5 year old son who loved making and decorating a pom pom. I then took them through the park to see the yarn bombing and bikes which we loved too. Well done to you and all your Yarndale team, hope you enjoy some well deserved rest soon. Congratulation for your blog full of colours works and happiness!! Oh Lucy, reading your blog is like visiting a good friend. It sets my world right to see your projects and hear about your activities. I've been reading your blog for years now (since before Little B was born), and it's always the first blog I check when I need a mental vacation into bloggyland. Best wishes on Yarndale and many big THANKS for your creative work and thoughts. Best of luck this weekend!! Very jealous I can't enjoy your weekend o' yarn. Everything looks Wonderful! You out did yourself.